In a paper published in the Jan. 12 issue of PLOS Pathogens, the research team showed how one pathogen, Pseudomonas syringae, leverages auxin to suppress its host's defenses and promote colonization and disease development. The bad bacteria infects a wide variety of plants, causing leaf-spotting blemishes, and is a familiar scourge to tomato farmers. "The pathogen is producing an important compound that the plant already makes, but too much of a good thing ends up not being good for the plant," said Barbara Kunkel, professor of biology in Arts & Sciences. "Our data suggest that the additional auxin is shifting or re-directing the response of the host in a way that favors growth of the pathogen inside the leaf tissue." Researchers in Kunkel's molecular genetics lab identified a novel enzyme that P. syringae strain DC3000 uses to synthesize auxin. Then they tapped biochemist Joseph Jez, professor of biology, and his postdoctoral fellow Soon Goo Lee to help characterize the enzyme biochemically, and map the enzyme's 3-D structure. They also modified the bacteria to disable its auxin-producing enzyme, and tested that mutant bacteria's ability to spread disease without its secret weapon. Their findings suggest that auxin produced by the pathogen promotes the pathogen's ability to extend its reach in plant tissue, thus increasing the severity of the disease symptoms on infected plants. "Plants have evolved a finely tuned balance of defense signalling pathways, controlled by different hormones," Kunkel said. 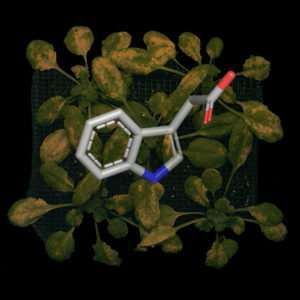 "Interestingly, auxin dampens the salicylic acid-mediated defense response. In effect, it turns down the strength of this response slightly, enough to allow the pathogen to grow to higher levels than it normally does."